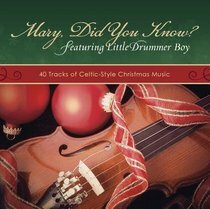 Mary Did You Know is a fantastic, new 2-disc set of 40 beloved Christmas songs performed in Celtic style, headlined by one of today's most popular songs, "Mary Did You Know?" Disc 1 includes 20 tracks featuring vocals from the Shetland Isles northeast of Scotland, and disc 2 rounds out the album with 20 instrumental tracks featuring authentic Celtic instruments. About "Mary Did You Know 2 Cds)"